A lack of admissible evidence, fourteen times? Justice Secretary MacAskill defends refusal to prosecute legal aid fraudsters. WHEN SCOTLAND’S JUSTICE SECRETARY has to rely on the ‘grubby’ defence of “a lack of admissible evidence” to support the actions of his own prosecutors who refused to prosecute AN ENTIRE CLASS OF CRIME spanning SIX YEARS involving legal colleagues accused of systematic fraud running into millions of pounds of public funds, you just know there’s something rotten in the justice system. 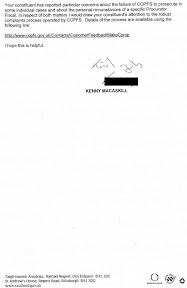 And so, amid revelations earlier this week where a solicitor suspected of legal aid fraud by the Scottish Legal Aid Board (SLAB) who was reported to the Crown Office turned out to be married to a Procurator Fiscal, and was let off the hook with a decision not to prosecute due to “a lack of admissible evidence”, KENNY MACASKILL, Scotland’s Justice Secretary has now told a Holyrood msp he backs the Crown Office refusal to prosecute any of FOURTEEN LAWYERS who swindled MILLIONS OF POUNDS in taxpayer funded legal aid because there wasn't enough evidence in each of the cases, and that just as the Crown Office had said, it was not in the public interest lawyers be hauled before the courts on criminal charges. 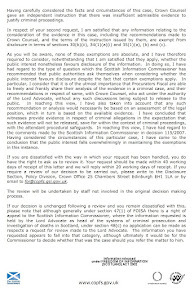 Mr MacAskill, responding to the Scottish Conservative’s Justice Spokesman John Lamont MSP over queries regarding the lack of any prosecutions of legal aid swindlers from the legal profession itself, is so confident SLAB & the Crown Office can handle legal aid crooks who are stealing millions of pounds a year from taxpayers, he dismissed the msp’s concerns, telling Mr Lamont that constituents can fill out an online complaint form located the Crown Office website if they wished to complain about the way the Crown Office refuse to prosecute lawyers. Legal insiders have also revealed a lawyer who stole millions in legal aid was married to a Police Officer in training when he was reported to the Crown Office. Even worse for the Justice Secretary, a senior legal insider has now revealed another of the solicitors accused of legal aid fraud, who was found to have stole millions of pounds from taxpayers was married to a Police Officer in training. The wife of the legal aid fraudster was allegedly due to pass out of Tulliallan Police College around the same time her lawyer husband committed suicide by standing in front of a train after his law firm had just been raided by the authorities in connection with a huge fraud inquiry. More on these latest developments will be reported in a future article investigating links between accused lawyers and Scotland’s crime agencies. 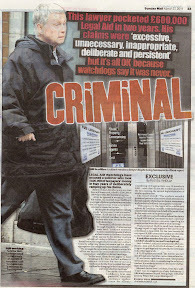 A senior legal figure who spoke to Diary of Injustice earlier in the week over the revelations one of the accused legal aid fraudsters was married to a Procurator Fiscal, also criticised Mr MacAskill’s claims the Crown Office were acting in the public interest by not prosecuting the solicitors accused of legal aid fraud. 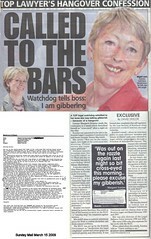 From this reporter’s own observations on this growing scandal, there is now little doubt this issue must go before the Scottish Parliament, with officials from both the Crown Office & Scottish Legal Aid Board called in to be questioned on why solicitors are escaping criminal prosecution for legal aid fraud costing taxpayers millions of pounds. A Crown Office FOI response to Diary of Injustice revealed : Since the start of 2005, SLAB has submitted nine reports to Crown Office alleging criminal offences by a total of thirteen solicitors. One report related to a firm of five solicitors; The allegations relating to eleven of these solicitors were marked for no action on the basis of an insufficiency of evidence. This related to seven separate reports (for which Crown Counsel’s Instructions were obtained in three); A report relating to one of the eleven solicitors referred to above was referred to the Civil Recovery Unit for their consideration; One solicitor died before criminal proceedings were commenced; One solicitor was placed on indictment for Sheriff and Jury proceedings for fraud. That solicitor entered a preliminary plea in bar of trial on the grounds of insanity which was sustained by the Court. In light of that decision, the case was deserted pro loco et tempore; and in relation to the final solicitor, the matter remains under consideration (this final case also resulted in a decision not to prosecute). Crown Office admitted additional lawyers escaped prosecutions over legal aid frauds. A further admission on lawyers referred by the Scottish Legal Aid Board over legal aid irregularities was made from the Crown Office relating to an additional case which had not been initially disclosed to Diary of Injustice. The admission contained details of yet another lawyer accused of allegations of a criminal nature, stating : SLAB made allegations of a criminal nature against a solicitor and sought preliminary advice from Crown Office. SLAB did not submit a crime report but were assisted by the police in carrying out further enquiries. A report was thereafter submitted by the police to the local Procurator Fiscal rather than Crown Office. The case was marked for no proceedings by the Procurator Fiscal. The solicitor, who legal sources have confirmed was “in a marital relationship with a Procurator Fiscal” is still working as a lawyer and is bizarrely still able to claim legal aid, after the Crown Office decided not to prosecute the solicitor concerned because of a lack of admissible evidence. The refusal to prosecute the solicitor partner of the Procurator Fiscal has angered insiders at the Scottish Legal Aid Board who claim they “are convinced of guilt in the case”. Crown Office were forced to admit alleged legal aid fraudster solicitor is married to a Procurator Fiscal. A response from Scott Pattison, the Deputy Director of Serious Casework for the Crown Office to a Freedom of Information request stated : “I can confirm that one of the solicitors who was reported by SLAB was married to a member of COPFS staff. In that case, in accordance with the practice which I have described above, the matter was reported by a Procurator Fiscal to Crown Counsel for consideration. 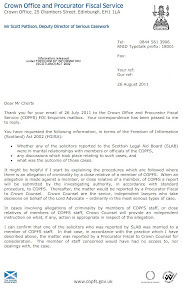 The member of staff concerned would have had no access to, nor dealings with, the case.” The Crown Office response to the FOI request, asking for information relating to (i) whether any of the solicitors reported to the Scottish Legal Aid Board (SLAB) were in marital relationships with members or officials of the COPFS, (ii) any discussions which took place relating to such cases, and (iii) what was the outcome of those cases, began with an attempt to explain how complaints against members of its own staff are dealt with. Since the investigation by Diary of Injustice into abuse of the legal aid system began turning up links between alleged legal aid fraudsters and Crown Office personnel, there have been indications the Crown Office are upset one of its own has now been publicly fingered in a case involving alleged legal aid fraud. A senior legal figure who has been given access to details of the case provided to Diary of Injustice described the Crown Office decision not to prosecute as “inconsistent with public claims of the law applying equally to all”. SLAB’s secret deal with Law Society of Scotland & LDU kept info on legal aid accusations against solicitor from clients. A VULNERABLE PENSIONER was left HOMELESS & HAD TO STARVE HERSELF to pay legal fees after being threatened by Kilmarnock solicitor Niels S Lockhart over a missed £100 payment of legal bills which were originally being paid by Legal Aid. Esther Francis, 70, had gone to Niels Lockhart for help in a dispute with her housing association and was originally put on legal aid by the lawyer who has already claimed around SIX HUNDRED THOUSAND POUNDS of legal aid money in previous years for other clients, however she was not told by the Scottish Legal Aid Board (SLAB) her solicitor, Mr Lockhart had ‘voluntarily’ withdrew himself from being able to provide legal aid, AFTER he was accused by SLAB of making excessive legal aid claims. Speaking to Diary of Injustice, Esther Francis spoke of the horrific situation her solicitor Mr Lockhart had put her in, which became so bad she was forced to put in a complaint to the Scottish Legal Complaints Commission (SLCC) about how she was treated. 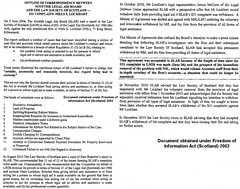 Esther has since found another solicitor but Mr Lockhart is now withholding her files so her situation regarding a resolution to her legal problems is far from certain until the SLCC and the Law Society of Scotland act against Mr Lockhart. Scottish Legal Aid Board did not tell Lockhart’s clients their solicitor could no longer do legal aid work. Crucially, the Scottish Legal Aid Board DID NOT tell Esther her solicitor had ‘removed himself’ from the legal aid register or that he had been accused of making ‘excessive legal aid claims’ by SLAB after a lengthy investigation into his claims. SLAB officials also did not inform Esther or any of Mr Lockhart’s clients that a complaint had been filed with the Law Society of Scotland about Lockhart’s legal aid claims. Esther only became aware of the fact her solicitor Mr Lockhart could not provide legal aid after she read the Sunday Mail newspaper article, reported HERE. Today, legal insiders who have studied media reports & details of what happened to Esther Francis believe most of Esther’s mounting legal problems and the negative effect of Mr Lockhart’s poor service on Esther’s health could all have been avoided if SLAB officials had communicated directly with Esther to let her know her lawyer was no longer entitled to provide her with legal representation funded by legal aid. 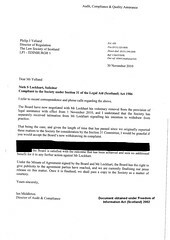 A solicitor speaking to Diary of Injustice condemned the Scottish Legal Aid Board for not writing to Esther directly to inform her that Mr Lockhart had been taken off the legal aid register. He accused SLAB of being directly responsible for the predicament of Ms Francis and many others who find themselves in the same position when their lawyers are found out as legal aid fraudsters. Several clients have told Diary of Injustice there appears to be no warning system in place for them to be directly told by SLAB of their solicitors change in legal aid when their certificates are withdrawn and why they have been withdrawn. A solicitor who works on legal aid confirmed there is no ‘warning system’ as such for clients in place that he is aware of. The Scottish Legal Aid Board said releasing the information may cause the solicitor unwarranted substantial damage or distress. The Scottish Legal Aid Board were asked for comment on why clients of solicitors who are removed from the Legal Aid Register are not told of the change in circumstances by SLAB, however SLAB have yet to issue a statement. ROGUE lawyer Niels Lockhart is being probed by legal watchdogs over his treatment of an OAP client. Esther Francis, 70, says Lockhart left her in financial ruin and threatened her over bills she couldn't afford. The lawyer was hired by Esther two years ago to sort out a dispute with a housing association, with his fees paid by legal aid. 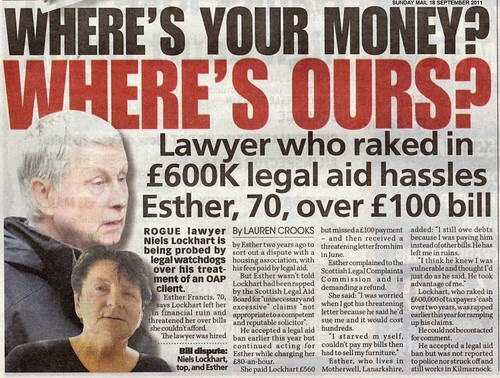 But Esther wasn't told Lockhart had been rapped by the Scottish Legal Aid Board for "unnecessary and excessive" claims "not appropriate to a competent and reputable solicitor". He accepted a legal aid ban earlier this year but continued acting for Esther while charging her £80-an-hour. She paid Lockhart £560 but missed a £100 payment - and then received a threatening letter from him in June. 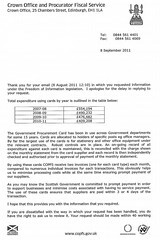 Esther complained to the Scottish Legal Complaints Commission and is demanding a refund. She said: "I was worried when I got his threatening letter because he said he'd sue me and it would cost hundreds. "I starved m yself, couldn't pay my bills then had to sell my furniture." Esther, who lives in Motherwell, Lanarkshire, added: "I still owe debts because I was paying him instead of other bills. He has left me in ruins. "I think he knew I was vulnerable and thought I'd just do as he said. He took advantage of me." Lockhart, who raked in £600,000 of taxpayers' cash over two years, was rapped earlier this year for ramping up his claims. He could not be contacted for comment. He accepted a legal aid ban but was not reported to police nor struck off and still works in Kilmarnock. 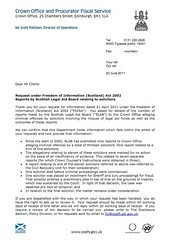 Diary of Injustice used Freedom of Information legislation to expose the secret deals done between the Scottish Legal Aid Board, Law Society of Scotland & the Legal Defence Union to prevent complaints against Lockhart being heard at the Law Society while also ensuring no criminal charges were asked for by SLAB officials over accusations of his inflated legal aid claims. 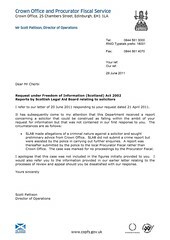 If the Scottish Legal Aid Board had put in so much effort & public expense to investigate Mr Lockhart for inflated legal aid claims, only to close their case with a secret agreement they refused to publish along with one of now revealed to be many Law Society attempts at a report in the case, surely SLAB could have easily contacted Mr Lockhart’s clients to inform them of the situation and how it may affect their access to justice. All that effort on behalf of the solicitor, yet no effort to inform or protect clients of Mr Lockhart or other solicitors who withdraw from legal aid work or are stripped of their legal aid certificates. This is not justice. This is certainly not consumer or client protection from a legal profession which claims to speak for the public interest as well as represent the interests of its members. Clearly Ms Francis interests and those of many other clients caught in the same circumstances, some second to the interests of solicitors and the legal profession as a whole. Lord Gill’s Civil Courts Review published in 2009 recommended significant reforms to Scots justice system yet little has changed in two years. TWO YEARS ON from the CIVIL COURTS REVIEW undertaken by Scotland’s Lord Justice Clerk, Lord Gill in February 2007 which culminated in his report published in September 2009 recommending significant wide ranging reforms to Scotland’s antiquated civil justice system, Scots are finding access to civil justice & access to courts has, in reality, changed little despite much talk at the Scottish Parliament on the report’s reforms and several amateur attempts by the Scottish Government to legislate wider access to justice, all of which have been watered down in the face of almost warlike hostility from lawyers worried their profit margins would sink as people chose other forms of getting to court. Sadly, the stinging criticisms of Lord Gill, who himself branded Scotland’s civil justice system as “Victorian”, failing to deliver efficiency of justice or Scots accessibility of justice appear to have been lost in the mists of time with little progress on the Lord Justice Clerk’s proposals to rectify the justice system’s ills, yet those consumers in Scotland who face the torture of using Scotland’s expensive, seemingly endemically dishonest legal profession to get to court, would rather the proposed reforms be speeded up than having review after review, and then as is now the case, reviews of the reviews. I reported on the ‘progress’ of the Sheriff Taylor review (the review of the review), earlier in July, here : Lawyers can talk, yet fee paying clients & court users remain shut out of Scottish Government review of the costs & funding of litigation in Scotland. A consultation was to be published on the Taylor Review website HERE although none has yet appeared. Clearly, Civil Justice Reform and giving Scots control over their own access to justice & legal services, instead of the present arrangement where the legal establishment and lawyers control & decide which Scots have access to justice, is not a priority for the Scottish Government. Indeed, it could well be argued the Scottish Government are delaying for as long as possible, most of the access to justice reforms because they will put power into the hands of Scots to resolve their legal issues & court issues much faster, at less cost, and with less potential for failure, than the present “Victorian” system offers us. The reason for the delays ? Well, its not too difficult to see if Scots are able to resolve their legal issues faster and cheaper, the legal profession are going to make a lot less money out of their clients. Reminding readers once again of those words, Lord Gill, in his speech to the Law Society of Scotland’s 60 year anniversary conference last year, said : “The civil justice system in Scotland is a Victorian model that had survived by means of periodic piecemeal reforms. But in substance its structure and procedures are those of a century and a half ago. It is failing the litigant and it is failing society." “Major reform and soon”, as Lord Gill said himself, has not happened. One may rightly being to wonder if Lord Gill’s reforms are ever expected to occur while the vested interests of money makers in the legal profession have their way. September 2010 has come and nearly ended, yet, again, little has changed for those in Scotland who need a justice system fit for the 21st Century, rather than what we currently have, the “Victorian” version controlled by vested interests from the legal establishment. My coverage of the Civil Courts Review from its publication to the present, and the pace of reforms to civil justice in Scotland can be found here : Civil Courts Review - The story so far however the story so far is that Scots do not have control over their own access to justice, and Scotland still has a justice system which is Victorian, prejudiced, politicised, controlled by vested interests & definitely a little crooked. THE second piece of research carried out by University of Manchester was a statistical analysis of data from claims. The research analysed the statistical data to establish if there were any relationships between different aspects of claims made. What the research did not do was explore or look into the detail of individual claims or seek to establish if there were underlying reasons for any findings. Yet after THREE YEARS, this latest attempt by the Scottish Legal Complaints Commission to investigate the Law Society of Scotland’s Guarantee Fund has resulted in yet another failure. There is noticeably no mention in the announcement of how the latest survey into the Master Policy is progressing, if at all. Clearly as long as the Law Society of Scotland control both the Guarantee Fund and the Master Policy, there will be no “ultimate client protection” for consumers of legal services in Scotland and clearly as long as the Scottish Legal Complaints Commission remains as cowardly and ineffective as it is, there will be no such thing as independent effective regulation of the legal profession in Scotland and therefore no protection for clients from ‘crooked lawyers’.